With such a great response from viewers with anything containing chocolate, I decided to try another confection involving the popular cocoa bean’s signature creation. I do love to eat chocolate but as a pastry chef it can get rather boring after awhile from all of the requests for it yet again with all of the requests comes great business so I can’t totally shun the chocoholics right ;). 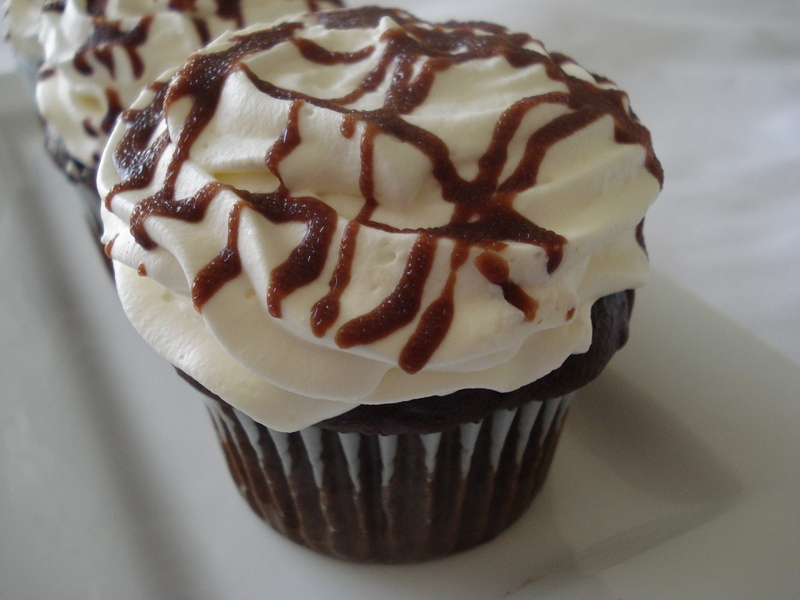 So today is all about playing up the rich and chocolaty cake flavor. 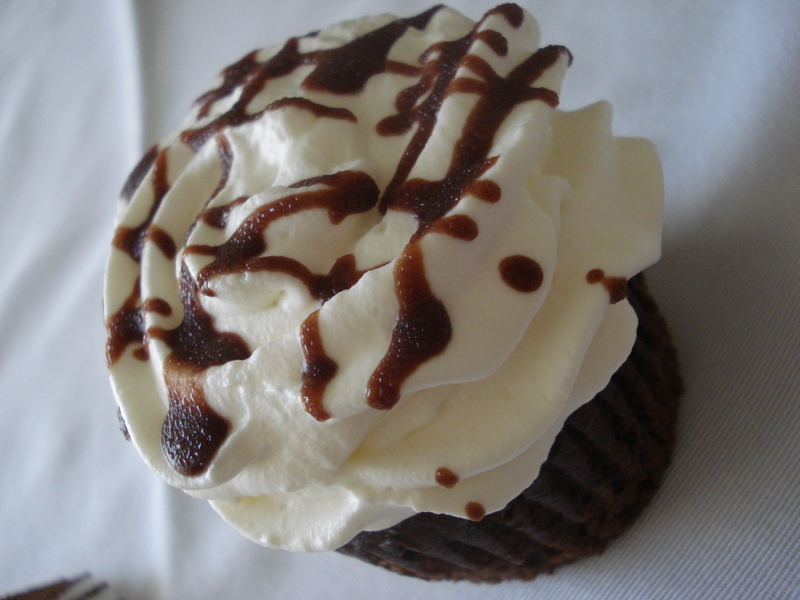 To keep the focus on the cake and off the frosting, I chose to use a light vanilla flavored Chantily Cream as it enhances the chocolate flavors without overpowering it. If I used a vanilla buttercream it would have been so heavily sweet and rich as the chocolate cake itself that the taste buds would be on sweets overload. Sometimes too much of a good thing is bad. So with that said I stuck with the light icing but played up the light fluffiness with a hit of chocolate glaze across the top to add shine and chic for presentation. The title itself brings to mind a haunting or Halloweenesque type cake but the darkness of the title doesn’t really relate to any particular ghoulish holiday. Rather, the rich chocolate cake hidden beneath the fluffy Chantily icing and drippy chocolate glaze is only haunting of the waistline when you eat the whole pan like I am tempted to do as they go down so quick and easily. 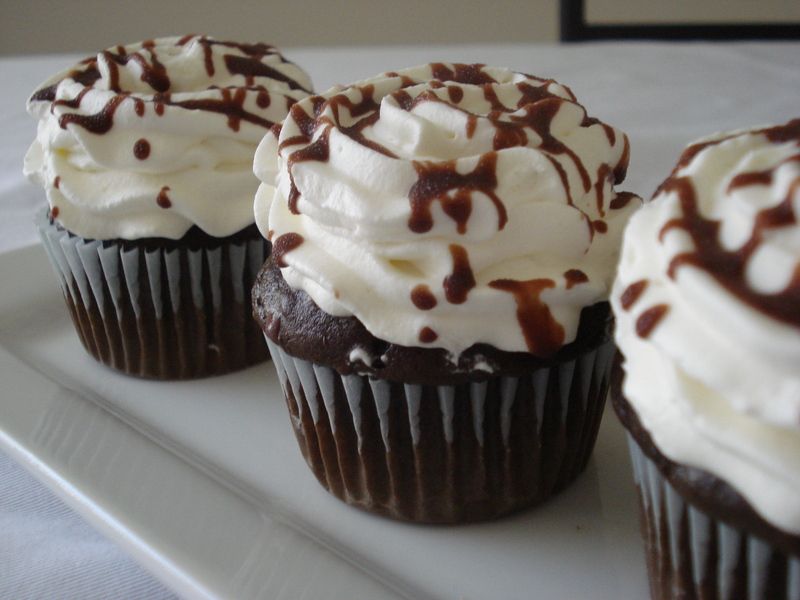 These cupcakes are sooo simple to prepare as with most cupcakes. You could assemble mini cakes in much the same way but you get more servings from using the formula to prepare cupcakes not to mention the cupcake method is a HUGE time saver over cake preparation. 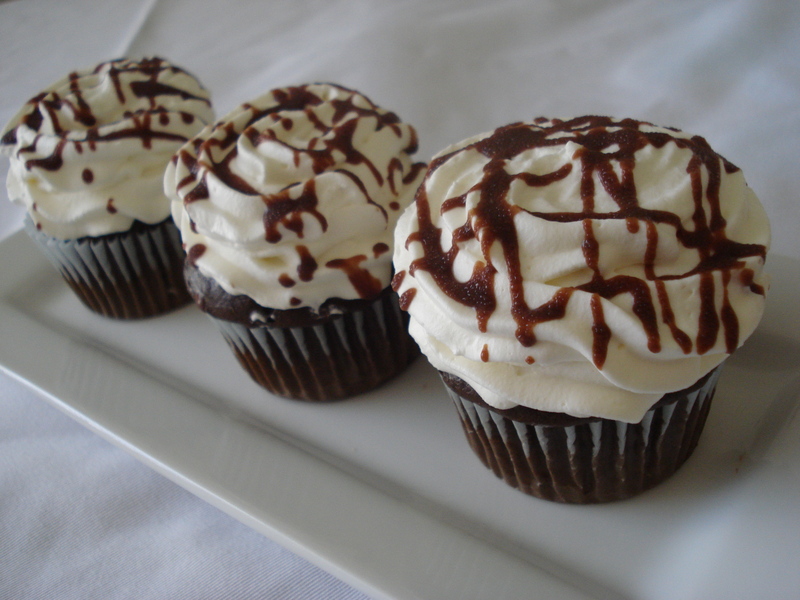 It’s easier to serve the cupcakes at a party or as the perfect crowd pleasing favor. I used them as a welcoming treat for relatives staying with me on vacation. Since it is hard to juggle work, blog, various personal endeavors, family, cats, well cats are my family… I must keep this short and sweet today and leave you to baking some Chocolate goodness of your own. Enjoy!!! Adjust oven rack to middle position and heat oven to 350°. Prepare chocolate cake batter according to your own personal favorite recipe or according to the instructions on a boxed cake mix. Line a regular size 24-count muffin baking pan with paper liners. 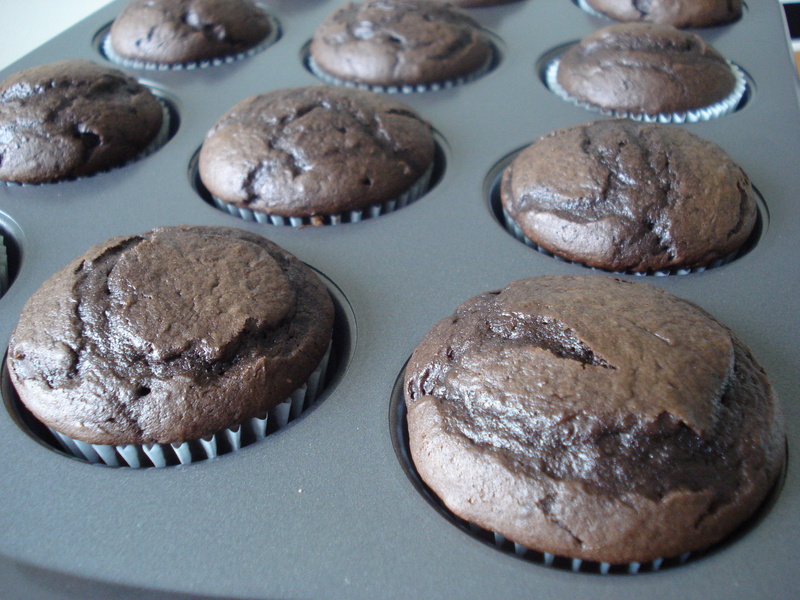 Divide the batter evenly among the cupcake liners in the pan, filling each liner about halfway full. Bake about 15-20 minutes. Remove from the oven and cool completely on a wire rack. To prepare the Chantily Cream, place the heavy cream, sugar, and vanilla in a large bowl. Beat until soft peaks form. Refrigerate until ready to use. HINT: To beat the cream the quickest, place your bowl and beater for the mixer in the refrigerator and chill with your heavy cream before preparing. Once the cupcakes are cool and the Chantily Cream is firm, fill a disposable piping bag fitted with a medium sized star tip (I used #843) with the Chantily Cream. Pipe the cream onto the cupcakes. Chill while preparing the Chocolate Glaze. For the Chocolate Glaze, place the chocolate, butter, and corn syrup in a large heat-resistant bowl set over a saucepan filled with barely simmering water. Make sure that the water is not too high that it touches the bowl. Stir constantly, until the chocolate is melted and smooth, then remove the bowl from the heat and let cool, about 5 minutes. Fill a pastry squeeze bottle with the melted chocolate mixture to decoratively drizzle over the frosted cupcakes or use the back of a spoon to drizzle in much the same manner. Chill and serve.